"Goin' racing. 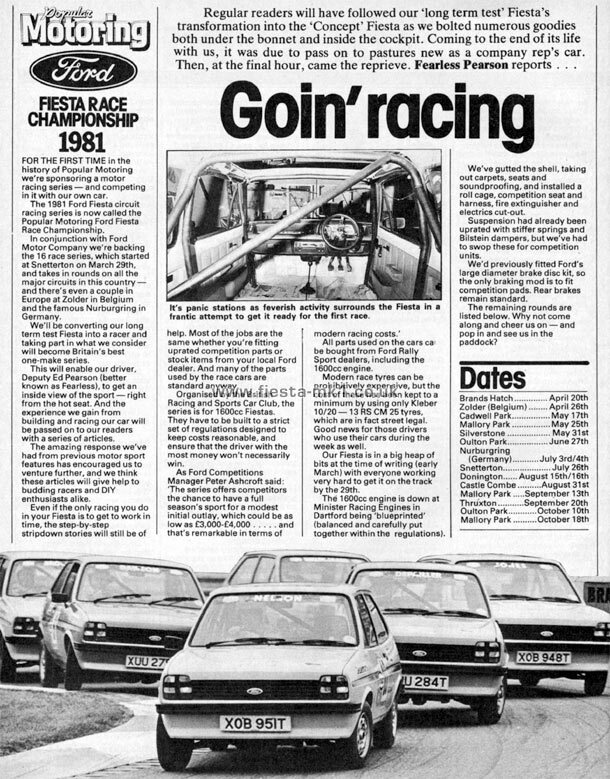 Fiesta Race Championship 1981"
Regular readers will have followed our 'long term test' Fiesta's transformation into the 'Concept' Fiesta as we bolted numerous goodies both under the bonnet and inside the cockpit. Coming to the end of its life with us, it was due to pass on to pastures new as a company rep's car. Then, at the final hour, came the reprieve. Fearless Pearson reports . . .
FOR THE FIRST TIME in the history of Popular Motoring we're sponsoring a motor racing series - and competing in it with our own car. The 1981 Ford Fiesta circuit racing series is now called the Popular Motoring Ford Fiesta Race Championship. In conjunction with Ford Motor Company we're backing the 16 race series, which started at Snetterton on March 29th, and takes in rounds on all the major circuits in this country - and there's even a couple in Europe at Zolder in Belgium and the famous Nurburgring in Germany. We'll be converting our long term test Fiesta into a racer and taking part in what we consider will become Britain's best one-make series. This will enable our driver. Deputy Ed Pearson (better known as Fearless), to get an inside view of the sport - right from the hot seat. And the experience we gain from building and racing our car will be passed on to our readers with a series of articles. The amazing response we've had from previous motor sport features has encouraged us to venture further, and we think these articles will give help to budding racers and DIY enthusiasts alike. Even if the only racing you do in your Fiesta is to get to work in time, the step-by-step stripdown stories will still be of help. Most of the jobs are the same whether you're fitting uprated competition parts or stock items from your local Ford dealer. And many of the parts used by the race cars are standard anyway. Organised by the British Racing and Sports Car Club, the series is for 1600cc Fiestas. They have to be built to a strict set of regulations designed to keep costs reasonable, and ensure that the driver with the most money won't necessarily win. All parts used on the cars ca be bought from Ford Rally Sport dealers, including the 1600cc engine. Modern race tyres can be prohibitively expensive, but the cost of these has been kept to a minimum by using only Kleber 10/20 - 13 RS CM 25 tyres, which are in fact street legal. Good news for those drivers who use their cars during the week as well. Our Fiesta is in a big heap of bits at the time of writing (early March) with everyone working very hard to get it on the track by the 29th. The 1600cc engine is down at Minister Racing Engines in Dartford being 'blueprinted' (balanced and carefully put together within the regulations). We've gutted the shell, taking out carpets, seats and soundproofing, and installed a roll cage, competition seat and harness, fire extinguisher and electrics cut-out. Suspension had already been uprated with stiffen springs and Bilstein dampers, but we've had to swop these for competition units. We'd previously fitted Ford's large diameter brake disc kit, so the only braking mod is to fit competition pads. Rear brakes remain standard. The remaining rounds are listed below. Why not come along and cheer us on - and pop in and see us in the paddock? Middle - It's panic stations as feverish activity surrounds the Fiesta in a frantic attempt to get it ready for the first race.